Manitoba Wildlands is providing some information regarding current thinking on how to build a global system to address the need to reduce our GHG emissions and prevent dangerous climate change. A large section of the vast West Antarctica ice sheet has begun falling apart and its continued melting now appears to be unstoppable. The melting could destabilize neighbouring parts of the ice sheet and a rise in sea level of 10 feet or more may be unavoidable. 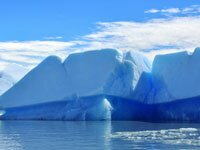 Global warming caused by the human-driven release of greenhouse gases has helped to destabilize the ice sheet. Climate scientists have concluded that widespread burning of fossil fuels is releasing heat-trapping gases that are warming the planet. While this will produce a host of effects, the most worrisome may be the melting of much of the earth's ice, which is likely to raise sea levels and flood coastal regions. "There are a lot of places in the world at risk from rising sea levels, but Bangladesh is at the top of everybody's list," said Rafael Reuveny, a professor in the School of Public and Environmental Affairs at Indiana University at Bloomington. "And the world is not ready to cope with the problems." An April 27, 2012 report, "Building Business Resilience in a Changing Climate," from the soon-to-be-defunct National Round Table on the Environment and the Economy (NTREE) warns that both business and government are woefully unprepared for the inevitable effects of climate change. The report urges the government to "improve access to reliable, relevant, and user-friendly climate change information and related guidance." It suggests that companies review all their activities through a climate lens, to figure out where they are vulnerable. It also urges securities regulators to step up their enforcement of disclosure guidelines, to make sure companies are spelling out climate change risks for investors. "We say climate change is a material risk," David McLaughlin, head of the NTREE advisory panel. Previous analysis done by the round table shows that climate change will drain $5 billion a year from the Canadian economy by 2020. The costs will climb steeply after that, chopping Canadian economic activity by between $21 billion and $43 billion a year by 2050, depending on how much action is taken to reduce greenhouse gases by then. At the same time a April 23, 2012 report, "Tracking Clean Energy Progress," by the International Energy Agency (IEA) says governments around the world must "level the playing field" to ensure clean energy technologies grow fast enough to prevent dangerous levels of global warming. Fossil fuel subsidies, including investments in Canada, increased by 37 per cent in 2010 to about $409 billion, while only a fraction of that amount - $66 billion - was offered in support for renewable energy options. Phasing out the fossil fuel subsidies would cut growth in energy demand by 4.1 per cent by 2020. Without changes to current policies average global temperatures stand to increase by six degrees Celsius according to the IEA report, which would have catastrophic planetary results. "Transition to a low-carbon energy sector is affordable and represents tremendous business opportunities, but investor confidence remains low due to policy frameworks that do not provide certainty and address key barriers to technology deployment. Private sector financing will only reach the levels required if governments create and maintain supportive business environments for low-carbon energy technologies," says the IEA report. Shell Canada has cancelled plans for a cellulose ethanol plant in Portage La Prairie, Manitoba. Plans at an Ottawa based Iogen Energy Corporation cellulose ethanol demonstration plant, with Shell Canada as partner, have also been scaled back. Unless cellulose ethanol can command a price premium for any greenhouse gas (GHG) reductions achieved, then regardless of Manitoba ethanol mandates, suppliers are likely to choose the lower cost and higher emitting first-generation ethanol fuels. Shell Canada Environmental and Regulatory Affairs Advisor Ed Brost indicated there were adequate biofuel stocks, easy access to rail and the TransCanada highway, the City of Portage and the Province of Manitoba had both been supportive. Based on the work Iogen and Shell Canada had done they felt the project was technically viable. Cellulosic ethanol is made from the non-food portion of crops, such as straw or cornhusks, whereas traditional ethanol is made from grains like corn or wheat. This reduces emissions because it does not require land-use changes associated with putting new cropland into production. Brost indicated that they felt they could have reduced GHG emissions by 60% or more when compared to petroleum gasoline on a life cycle basis. In comparison, some studies show that grain-based ethanol can actually increase emissions when compared with fossil based gasoline on a lifecycle basis. Brost said Shell had planned to apply for a Manitoba Environment Act license for the plant in late summer or early fall 2012. The plant would have created 70-100 jobs, and more than 300 farmers had already signed up to supply the facility with straw. Brost said there was "no plans to restart the project," and that the decision to scrap the plan was a business decision, which "had nothing to do with anything in Manitoba." The Canadian and provincial governments spend about $250 million annually to subsidize energy production of biofuels by companies such as Husky Energy Inc. and Suncor Energy Inc., according to the agriculture think-tank George Morris Centre. 350.org has just announced their next big global day of climate action. It's called Moving Planet. Moving Planet is a worldwide rally to demand solutions to the climate crisis–a single day to move away from fossil fuels. On September 24th, 2011 people in countries literally all around the world will organize thousands of events with a common theme: moving the world beyond fossil fuels. In Sao Paolo, Brazil hundreds of activists will "take back" a viaduct that is locally notorious as a symbol of bad auto-centric traffic planning. In Johannesburg, South Africa, youth will join hands with trade union members and call for an end to coal mining and jobs training programs for transitioning miners. Check out the Moving Planet map to see if there's an event planned near you–and, if not, plan one. Come on bike, on skates, on a board, or just on foot. Come with your neighbors and your friends, your family and your co-workers. Come be part of something huge. Roughly 400 scientists at a major conference on Arctic warming May 4, 2011 were told to use plain language to explain the dramatic melt in the region to a world reluctant to take action against climate change. James White, of the University of Colorado at Boulder, told fellow researchers to use simple words and focus on the big picture when describing their research to a wider audience. "Stop speaking in code. Rather than 'anthropogenic,' you could say 'human caused,'" said Prominent U.S. climate scientist Robert Corell. The scientists were discussing two new reports issued by the Arctic Monitoring Assessment Programme (AMAP), a scientific body set up by the eight Arctic rim countries. The first report "Climate Change and POPs: Predicting the Impacts" warns of Arctic warming twice the global average in recent decades, leading to revised projections of dramatically higher sea levels. The second report "Arctic Pollution 2011" shows that Global mercury emissions could grow by 25 percent by 2020 if no action is taken to control them, posing a threat to polar bears, whales and seals and the Arctic communities who hunt those animals for food. View Arctic Monitoring Assessment Programme "Climate Change and POPs"
View Arctic Monitoring Assessment Programme "Arctic Pollution"
The "End Canadian Fossil Fuel Tax Breaks Counter" displays the running tally of fossil fuel subsidies since Canadian Prime Minister Stephen Harper formally committed to start phasing out subsidies to fossil fuels at the G20 in Pittsburgh September 25, 2009. The Canadian government provides about $1.38 billion per year to subsidize oil production. 67 national organizations have endorsed the call to end tax breaks to dirty fuels. Take action and ensure the government stops these irresponsible tax-breaks in 2011: sign the Climate Action Network open letter, contact your local Canadian Member of Parliament, and upload the counter to your blog or website. 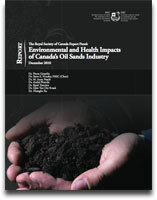 "Today the scientists of the Royal Society of Canada confirmed that there are many serious gaps in the environmental assessment, regulation and monitoring of Canada's oilsands industry," said Pembina Institute Policy Director Simon Dyer following the release of an expert report Environmental and Health Impacts of Canada's Oil Sands Industry. "If we were to stop oilsands mining tomorrow, we would still have an issue that was going to be associated with water -- both from the tailings ponds and from the potential threats on groundwater -- for many decades to come," said aquatic toxicology specialist and report co-author University of Guelph professor Glen Van Der Kraak. The report is critical of industry and government and calls for increased monitoring and more rigorous scientific oversight. But it also dismisses any correlation between oil sands pollution and an elevated cancer rates in Fort Chipewyan, a Mikisew first nations community in Northern Alberta. "All the studies that we've been conducting and all the information that we've been receiving states that there is something wrong. What about cumulative effects, after long periods of time?" responded Chief Allan Adam of the Athabasca Chipewyan First Nation. "We have the knowledge based on us living on the land and seeing what is happening to our people," said Alice Martin, a Mikisew Cree elder. "The report is solid and comprehensive. It raises issues that need to be addressed and puts into perspective the actual impacts of oil sands development," said Alberta Environment Minister Rob Renner. "To date Governments' attempts to address the deficiencies highlighted by the Royal Society panel have been ineffective, with a much greater emphasis on expanding oilsands development rather than on ensuring the environment and Canadians are protected," said Jennifer Grant, oilsands director of the Pembina Institute. "We strive strongly for balance, not for sensationalism. For me, the take-home message of the report is we have very strong failures in our regulatory and oversight system, both at the federal and provincial levels. That needs urgent attention," said William Leiss, report co-author and a University of Ottawa professor. In the United States mid-term election on November 2, 2010 California voters defeated Proposition 23, and most members of Congress who helped pass California's clean energy and climate legislation in 2009 kept their seats. Climate change was front-and-center in California. Regardless of partisan stripe the state's voters overwhelmingly rejected Proposition 23, an oil industry backed ballot initiative, which aimed to repeal California's climate law. The 'Yes on Prop 23' campaign received over $8 million in funding from the Texas oil companies Valero and Tesoro, and millions more from the Kansas-based fossil fuel company Koch industries. Not to be outdone the 'No on 23' campaign ended up raising more funds than its opponent, largely from venture capitalists and donors who back the clean tech industry. 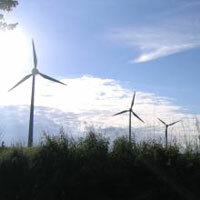 California's clean energy sector joined forces to create a broad coalition including leaders in Silicon Valley, youth activists, climate action groups, Democrats, moderate Republicans, outgoing Republican Governor Arnold Schwarzenegger, and George P. Shultz, Secretary of State under Ronald Reagan. "This is the new face of the clean energy economy. This broad coalition will continue to push for California to be on the cutting edge in building the new energy economy," Shultz said. In the midst of an economic slump, Californians are seeing the benefits of a low carbon future. Green jobs in California have grown 10 times faster than the statewide average over the past five years, and the clean tech sector attracted $9 billion venture capital investment from 2005 through 2009. "Voters understand clean energy jobs already exist and offer the best promise for economic growth. They recognize that we can have a clean environment and a healthy economy," said Tom Steyer, co-chairman of the Stop Dirty Energy Proposition campaign. Three litigations (Connecticut v. American Electric Power, Comer v. Murphy Oil, and Village of Kialina v. ExxonMobil Corporation) moving through the U.S. court system against oil, electricity and coal companies may increase support for U.S. climate legislation. "The more these lawsuits succeed, the more that puts pressure on the industry groups to support comprehensive climate legislation, or at least not oppose it," says Jonathan Zasloff, an expert in tort and environmental law at the University of California-Los Angeles. All three suits rely upon the theory that climate change is a public nuisance and, therefore, state and local governments, as well as individuals who have been harmed, can sue for damages or injunctions. They also make arguments that proved successful against the big tobacco companies in the 1990's arguing corporations conspire to create a false scientific debate about global warming in order to deceive the public. ExxonMobil, for example, is accused of channeling $16 million over a seven-year period to 42 organizations that promote false information on global warming. All three cases were dismissed by the District Courts. Connecticut and Comer were reinstated on Appeal and are scheduled for further review by the U.S. Supreme Court. The appeal of Kivalina is still pending. American Electric Power v. Connecticut was filed July 24, 2004 by eight US States, the City of New York, and three NGOs against the five biggest US power companies, on the basis that the huge emissions from the defendants' power plants contribute to climate change and are a public nuisance, asking the court to order emissions reductions. In a September 15, 2005 decision, the U.S. District Court for the Southern District of New York dismissed the complaints. On December 15, 2005 the dismissal was appealed to the Second Circuit Court of Appeals. On 21 September 2009, the US Court of Appeals ruled in favour of the plaintiffs. The power companies asked the Supreme Court to review their petition August 2, 2010. Comer v. Murphy Oil was filed by property owners along Mississippi's Gulf Coast against several insurance companies as well as oil companies seeking damages related to Hurricane Katrina. The plaintiffs alleged that the oil companies had "engaged in activities that have produced the greatest single source of by-products leading to the development and increase of global warming," and that the environmental conditions in the Gulf of Mexico that fostered the strengthening of Hurricane Katrina were "the direct result of" global warming. The case was dismissed by the District Court in August 2007 on the basis that the private parties lacked standing to bring their claims based on common law property rights. The Fifth Circuit of the United States Court of Appeals instructed the District Court to reinstate several of the plaintiffs' climate change-related claims on October 22, 2009 but a series of recusals left the court without a quorum. The remaining judges dismissed the appeal, leaving in place the district court judgment against the plaintiffs. A petition for writ of mandamus asks the Supreme Court to direct the 5th Circuit to decide the appeal or reinstate the panel ruling. Village of Kialina v. ExxonMobil Corporation was filed by Kivalina, a small Inupiat Alaskan community of 400, February 26, 2008 against 24 companies, including ExxonMobil, ConocoPhillips, British Petroleum, Chevron, and Shell. A September 2007 report by the US Army Corps of Engineers outlined the need for the coastal community to move due climate change risks such as rising sea levels and soil erosion and the community is seeking $400 million to help with relocation costs. The suit was dismissed by the United States district court for the Northern District of California on September 30, 2009, but has been appealed to the 9th U.S. Circuit Court of Appeals. "If the Court does not act on Connecticut or Comer, I think Kivalina will go forward. I think that one could end up being the most dangerous of any of them. But getting into court is one thing; proving causation is a very hard row to hoe," stated Environmental litigator Steven Jones. Degrees of Change, a 2010 report from the National Roundtable on the Environment and the Economy (NRTREE) and the Royal Canadian Geographic Society, embarassingly asks Canadians to 'embrace the concept of climate prosperity. "There are risks to climate change, clearly, but there are also opportunities," explains David McLaughlin, president of the NRTEE, "climate change is happening, and we can deal with it, and we can gain from it." Critics however note that for almost every benefit, there is also a downside. We get a new breadbasket in the East at the cost of drought and desertification in the Prairies. Arctic shipping will become more feasible as the arctic continues to melt, but shipping through the Great Lakes and St. Lawrence Seaway will get more expensive, as lower water levels mean that ships must carry smaller loads. "The chart needs to be withdrawn," said climate scientist Danny Harvey of the University of Toronto. "It is full of bad science and utterly downplays the serious impacts of climate change. How can we (Canada) talk about profiting from climate change when most of the world will suffer devastating impacts, in part because of our emissions? It is disgusting." James Hansen is a prominent climate change researcher who heads the NASA Goddard Institute for Space Studies in New York City, and is an adjunct professor through Columbia University. Dr. Hansen outlines aspects of climate change on his Columbia University website, including Global Temperatures, Sea Level, Ice Sheet Disintegration, and Sea Ice Area. These website use some of the most current data to show the effects of climate change across the world. Dr. Hansen has received an array of awards for his work, including the Goddard Special Achievement Award, the GISS Best Scientific Publication four time over for his work on Climate Change, and The Dan David Prize for Outstanding Achievements & Impacts in Quest for Energy. Dr. Hansen also published a book, Storms of My Grandchildren, in which he speaks out regarding global warming: The planet is hurtling even more rapidly than previously acknowledged to a climatic point of no return. He is also an optimist, showing that there is still time to do what we need to save the planet. Dr. Hansen publishes through the New York Times, The Observer, The Huffington Post, The News Scientist and The Boston Globe. 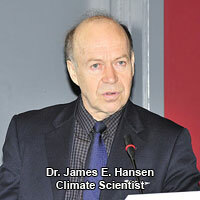 Dr. Hansen works also intensely as a climate and environmental activist. He has been involved in the debate surrounding mountaintop mining - the process of mining for coal by clear-cutting forests, blowing the tops off of mountains, and dumping the debris into streambeds. Dr. Hansen is calling on the Obama administration to prohibit this practice, in addition to improving their policies on energy efficient/carbon free energies. September 2009, two hundred scientists petitioned US Environmental Protection Agency (EPA) to look at indirect land use change as a major source of green house gas (GHG) emissions from biofuels, particularly corn ethanol. This petition came from the realization of devastating effects land clearing for crop production is having on vital carbon sinks like tropical forests. The EPA has revised their National Renewable Fuel Standard (RFS) Program (adopted in 2005) and has initiated analyzed lifecycle greenhouse gas (GHG) emissions analysis for renewable fuels. Life cycle analysis of biofuels means they will be analyzed for direct emissions (ie: tail-pipe) and indirect emissions (ie: land use changes and feedstock production, distribution, and extraction). Revisions to the RFS require a 20% reduction in lifecycle GHG emissions for any renewable fuel produced at new facilities, and a 60% reduction of GHG emissions to be classified as a biomass-based diesel, advanced biofuel or cellulosic biofuel, compared to lifecycle GHG emissions from gasoline or diesel (whichever the renewable fuel is replacing). Revisions to the RFS also involve the EPA making GHG threshold determinations for biofuels based on full lifecycle analysis of fuels, stricter requirements for feedstock producers, and increased volume requirements . After much study and peer review the EPA is confident its modeling of GHG emissions associated with international land use is comprehensive and provides a good basis for making threshold determinations for biofuels. The EPA is committed to continued monitoring of estimates and evolution in lifecycle GHG assessments. In Canada, Manitoba, Saskatchewan, Quebec and Ontario all have renewable fuel standards for their jurisdictions. The Pembina Institute has graded 9 oil sands facilities in Athabasca, Peace River, and Cold Lake regions, in their new report Deeper Drilling: The In Situ Oil Sands Report Card. This is the first comparative environmental assessment of oil sands projects, The average grade was poor at only 44%. In-Situ oil sand projects involve drilling several wells into oil sand deposits, heating the oil from underground causing it to move to surface sands. This is a very "environmentally intense" process that allows access to Alberta's oil resources that are too deep to mine traditionally. 140, 200 km2 in Northern Alberta has already been leased for oil sands development. Deeper Drilling compares projects on 17 environmental indicators in five categories: general environmental management, land, air, emissions, water and climate change. The highest scoring site had a grade of 60% and the lowest 25%. The 44% average indicates Canada's regulatory standards for in-situ oil sands drilling are too low and need improvement such as implementing industry best practices. Areas of concern in Deeper Drilling are: increased greenhouse gas emissions like SO2, no consideration for cumulative impacts of projects despite the scale of boreal forest being lost, and lack of public environmental performance data. The report also found companies have no reduction targets for GHG emissions or water use, have not invested in biodiversity offsets, do not have accredited environmental management systems. and very few support the Alberta Biodiversity Monitoring Institute. Troubling Evidence: The Harper Government's Approach to Climate Science Research in Canada by Climate Action Network (CAN Net) details Canadian federal government actions to silence its own climate scientists and weaken their research capacity. Federal budget excludes funding to the Canadian Foundation for Climate and Atmospheric Sciences (CFCAS), the most important funding body for university-based research on climate science in Canada. This report also includes six recommendations for changes in government policy to deal with these issues and details the true need for Canadian climate research. Sierra Club Canada released Climate Change Science Since 2007, looking at updates and changes since the Intergovernmental Panel on Climate Change (IPCC) publication in 2007. This report examines effects of climate change on Arctic sea ice coverage, Greenland and Antarctic ice melt, changes in sea level and acidification, global atmospheric temperature and ocean temperature, solar activity and climate change impacts. The goal of Climate Change Science is to show climate change has accelerated since 2007 and to point out climate change effects may reach a point where a threshold is crossed and feedback effects accelerate changes that "dwarf present effects on human emissions". Staggering findings from Climate Change Science show sea levels are rising higher than predicted, glacier velocities are increasing, and ocean acidity increased 41% in the last 30 years. It also shows both atmospheric and ocean temperatures have risen dramatically. The report also indicates the sun may be seeing a decrease in sun spot activity (11 year cycle) resulting in a decrease in solar radiation reaching earth, possibly for the next decade. This will have an offsetting effect on the effects of global warming. Carla Lipsig-Mummé, professor of Work and Labor Studies at the University of York, has been awarded $1 million for six years of research from the Social Sciences and Humanities Research Council of Canada. The money will fund an international project studying challenges climate change presents to Canadian employment and workplaces. Lipsig-Mummé will be examining 7 employment sectors looking at policy, training and employment, and workplace solutions to help businesses in the face of climate change and resulting changes in economy. Her central question is, "How can Institutions of work adapt more effectively, and contribute more fully, to the struggle to contain global warming? 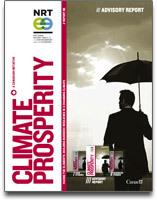 How will the institutions of work be required to change in the face of climate change?". "We need to know more about the chain of processes that comprise work, employment and training in key Canadian industries and professions and how their decision-makers understand and respond to the challenge that global warming poses to these processes," said Lipsig-Mummé. "Everywhere, the growth of small and medium-sized businesses poses a risk to changing the culture of energy use. In prosperous, climate-extreme countries like Canada, global warming threatens job loss in transport and energy-intensive industries, but opens the possibility of employment in new and technologically reorganized sectors - if only we are able to plan an integrated strategy of training, investment and representation for these sectors." The President of the Natural Resources Defence Council Frances Beinecke, released her new book, Clean Energy Common Sense: An American Call To Action on Global Climate Change, November 10, 2009. This book educates Americans about the facts of carbon pollution and how to stop it. It is released to coincide with the push to increase support against global warming prior to Copenhagen talks in December. Beinecke's book is her reaction to those who argue that global warming is not as big a problem as it is being made out to be and she wants the general public to know the truth on the issue. Beinecke is trying to coax American to "listen to the most authoritative experts in the field", quoting NASA, the Marine Corps, the Department of Energy and the Environmental Protection Agency. When asked what's new about this appeal for climate change, Beinecke said that with the changing economy this is an issue that people can rally around. It will put people back to work, reduce reliance on foreign oil and create a healthier future. This book focuses on three main issues: that climate change is already causing harm, that failing to act threatens national security and that people don't have to and shouldn't wait to act. A report by WWF and Allianz, Major Tipping Points in the Earth's Climate System and Consequences for the Insurance Sector, released November 23rd, states that the world's ecosystems are close to reaching temperature thresholds or "tipping points" that can unleash devastating environmental, social and economic changes. Without immediate climate action, sea level rise on the East Coast of the USA, the shift to an arid climate in California, disturbances of the Indian Summer Monsoon in India and Nepal or the dieback of the Amazon rainforest due to increasing drought, are likely to affect hundreds millions of people and cost hundreds of billions of dollars. The study explores impacts of these "tipping points," including their economic consequences and implications for the insurance sector. "If we don't take immediate action against climate change, we are in grave danger of disruptive and devastating changes," states Kim Carstensen, the Head of WWF Global Climate Initiative. "Reaching a tipping point means losing something forever. This must be a strong argument for world leaders to agree a strong and binding climate deal in Copenhagen in December." According to the report, the impacts of passing "Tipping Points" on the livelihood of people and economic assets have been underestimated so far. This report focuses on regions and phenomena where climate events might be expected to cause significant impacts within the first half of the century. "Economic consequences of passing climate tipping points are absolutely overwhelming." Carstensen states. "There is still a chance to avoid the worst and this report shows how urgent it is to act immediately. A strong climate agreement in Copenhagen in December is the best, if not the only chance to prevent the worst impacts of devastating climate change."